An international collaboration of scientists at the Department of Energy's Fermi National Accelerator Laboratory have observed the disappearance of muon neutrinos traveling from the lab's site in Illinois to a particle detector in Minnesota. The observation is consistent with an effect known as neutrino oscillation, in which neutrinos change from one kind to another. Neutrinos are ghost-like particles and rarely interact with matter. 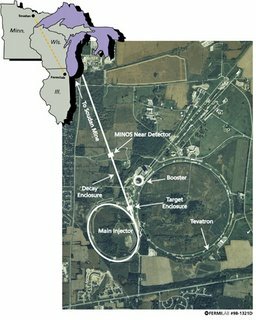 In this experiment, they travelled 450 miles straight through the earth from Fermilab to Soudan. They needed no tunnel because they do not interact with matter. The Main Injector Neutrino Oscillation Search (MINOS) experiment studies the neutrino beam using two detectors. The MINOS near detector, located at Fermilab, records the composition of the neutrino beam as it leaves the Fermilab site. The MINOS far detector, located in Minnesota, half a mile underground, again analyzes the neutrino beam. This allows scientists to directly study the oscillation of neutrinos among its 3 types: muon neutrinos, electron neutrinos or tau neutrinos under laboratory conditions. The abundance of neutrinos in the universe, produced by stars and nuclear processes, may explain how galaxies formed and why antimatter has disappeared. Ultimately, these elusive particles may explain the origin of the neutrons, protons and electrons that make up all the matter in the world around us. The MINOS experiment revealed a value of delta m^2 = 0.0031 eV^2, a quantity that plays a crucial role in neutrino oscillations and hence the role of neutrinos in the evolution of the universe. An accurate measurement of this quantity is essential for understanding quantitatively how neutrinos behave and determine the fate of the universe in certain ways. The MINOS experiment includes about 150 scientists, engineers, technical specialists, and students from 32 institutions in six countries, including Brazil, France, Greece, Russia, the United Kingdom, and the United States.